If you have Apple products, you undoubtedly want any smart home devices you buy to be compatible with HomeKit. Of course, actually finding good smart home gadgets that work with HomeKit isn’t always easy. Good news: Philips just announced that three of its most popular products have been updated to work with HomeKit. 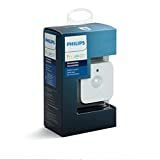 The updates hit the Philips Hue Smart Dimmer Switch with Remote, the Philips Hue Smart Motion Sensor, and the Philips Hue Smart Tap Switch, all of which are available right now on Amazon. In fact, the motion sensor even has a nice little discount if you hurry. Quickly dim or brighten up to 10 of your room lights for games, parties, and movies from the comfort of your couch or bed. Requiring the Hue Bridge (sold separately) for the full Hue experience, this battery-powered dimmer with remote smoothly and wirelessly adjusts your lights’ intensity without any added installation. 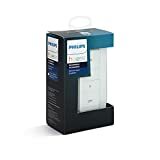 Mount the Hue Dimmer Switch anywhere with screws or adhesive tape (both sold separately) and control using the remote or the Philips Hue App with the Philips Hue Bridge. Connect it with your Nest or Samsung SmartThings system. Each kit includes one Hue Dimmer Switch with wall plate and remote, a CR2450 battery, manual, and two-year warranty. Light up a room simply by walking in and control the intensity by the time of day, such as a gentle, warm nightlight to help you navigate your home at night. 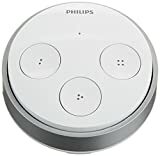 Battery powered, wireless, and installation free, this Hue Motion Sensor requires the Hue Bridge (sold separately) to work, connecting to your Hue system with control via the Philips Hue App. Place it anywhere in your home including your hallway, bathroom, kitchen, and more. The integrated light sensor saves energy by detecting when rooms are vacant and automatically turning off lights. Connect it with your Nest or Samsung SmartThings system. Each kit includes one Hue Motion Sensor with two AAA alkaline batteries, a magnet, screws, a manual, and a two-year warranty. Remotely recall your four favorite Philips Hue light scenes at the press of a button. Select from your own scenes, scenes created by Philips, or program a button to switch all lights off. Requiring the Hue Bridge (sold separately) for the full Hue experience, this switch does not need batteries. It uses kinetic energy and is powered by your touch. Mount the Hue Tap anywhere with the included mounting plate, or detach it and carry it with you as you move through your home. Add up to 12 other Hue accessories (sold separately) such as the Hue Dimmer Switch or Hue Motion Sensor. Control by voice with Amazon Alexa, Apple HomeKit, and Google Assistant. Connect it with your Nest or Samsung SmartThings system. This box includes a Hue Tap with wall plate and two-year warranty.